The Backbencher – Social Media, the Tories May Want to Reconsider…. 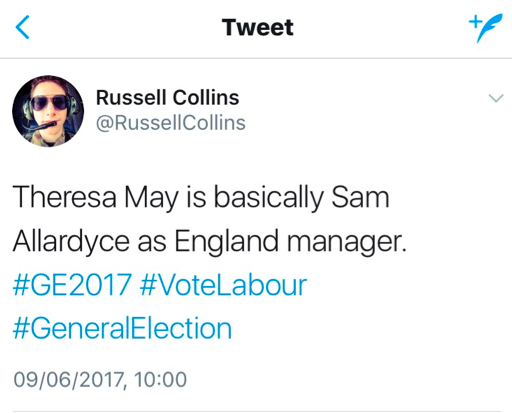 This General Election taught us a lot. Between headlines on Brexit and ‘Dementia Tax’ one fascinating trend emerged: social media became a vast political platform, moreso even than in 2015, as the younger demographic engaged in the debate. Facebook, Snapchat, Youtube, Instagram: all outlets of public opinion and individual expression that completely blindsided the political landscape. An election cannot be fought wholly offline, because, with an unprecedentedly high youth turnout, we have a growing electorate online. 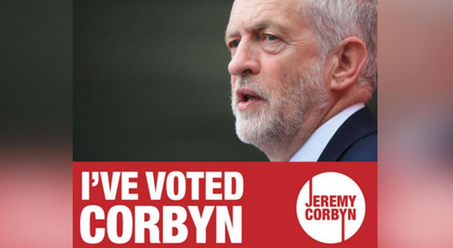 The official loser of this election, Jeremy Corbyn, is acting very much like the winner. In part, this is because he recognises his success with the young, upcoming generation of voters. The electorate of tomorrow – many of them first time voters – are the bulk of his 1.25 million Twitter followers, the majority of his 1.24 million Facebook likes. Theresa May – currently cowering in Number 10 – has only 354 thousand Twitter faithful, and an only slightly better 426 thousand Facebook likes. These numbers reveal something crucial; the Conservative party and their fragile leadership need to re-engage with social media. With the fragile state of government and thus the possibility of another election looming, they need to do it fast. Labour’s online presence generated positive responses. For the Conservatives, less positive. The Conservative Party stands for tradition, principal, heritage, and organicism. But with social media, it needs to be innovative. It needs to rethink its approach, and rethink its rhetoric. As far as content goes, Theresa May has not engaged with the fallout of the election once online, the official Conservative Party page (which has only 270 thousand followers) has posted only a single message of generic thanks to supporters. Whilst the Right stays silent, Jeremy’s Left has covered social media outlets with a plethora of quotes, soundbites, and pleas for support. Conservative engagement with social media looks very much like a begrudgingly half-hearted effort to pander to the electorate during the bitter weeks of the campaign, and reads like an uninspired electoral afterthought. In contrast, Corbyn and the Labour social media feeds have produced different forms of media to interact with their followers, as well as positive tweets aimed at promoting voter turnout and encouraging political engagement, especially beyond the election. 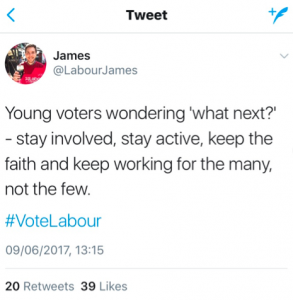 It’s no wonder that sites popular with young people and students, such as the Tab, or UniLad, have come out with heavily pro-Labour articles and content. Despite the criticism it faced, the Conservative manifesto was thought-through, well costed, and contained several much needed ideas and policies. Labour’s manifesto was a far-left offering with a huge price tag, and yet it was this that generated a rhetoric of ‘hope’ online. Labour’s positive and sustained online presence jarred with the negative and bitpart social media campaign ran by the Tories. Social media is about creating and displaying an image, and the image of hope was far more promotable – far more ‘retweetable’ – than the image of a party out of touch with the youth vote. This image was one that gained huge momentum online, driven by committed official platforms, and developing support outside of the official party pages. Be it Google searches for the party leaders, or posts and presence on social media, Corbyn’s party had almost twice the visibility of the Tories. What’s startling is that much of the Labour chatter on social media came from unofficial sources, from supporters, the electorate. Memes and images mocked both parties and their leadership, but the overwhelming presence of online debate and engagement favoured Labour. Such a huge body of support online gave Corbyn a voice for what he could not say himself. Through parody and humour, or serious debate and discourse (although funnily enough the latter is often absent from social media platforms) Corbyn had a huge propaganda machine, ridiculing the Right, glorifying the Left. The social media battle was a walkover, a dominant victory for the Left, and one that the Tories cannot again allow themselves to concede. Social media is fast becoming the platform young people spend the vast majority of their time and effort accessing and utilising. To engage with these young people an effective engagement with social media is crucial. Labour ran a positive, diverse and engaging online campaign. The Conservatives online presence felt flat, negative, and underwhelming. Perhaps this stems from a fear of the left-leaning tendencies of the younger demographic, but this is never going to be something that changes unless it is challenged. If the Conservatives want a larger share of the youth vote, they need to appeal more to them, and a key means of achieving this will be social media. Reluctantly, perhaps, the Conservative Party must tackle head on the complex world of retweets, soundbites, and memes. By plunging headfirst into this world, they can begin to appeal more to these voters. We don’t live in an offline world, and so we can’t expect to fight an offline election and win.